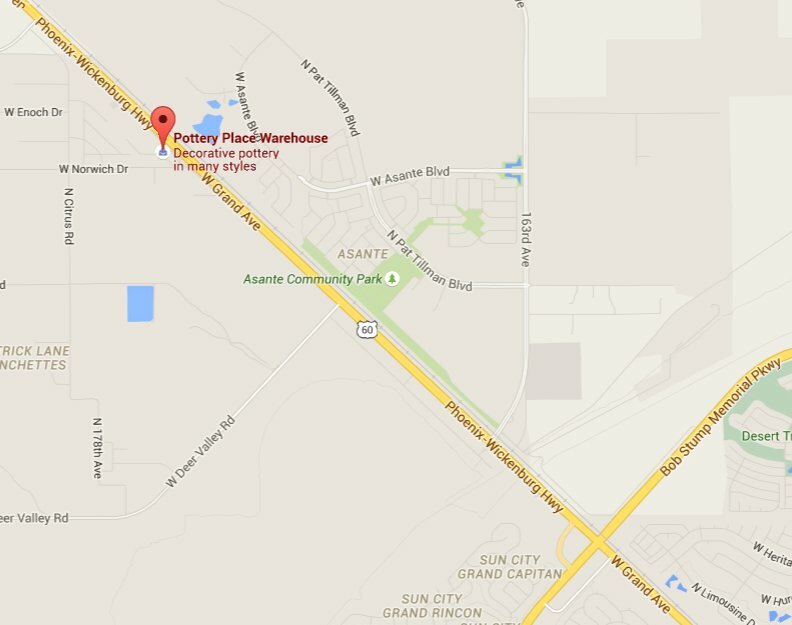 It may be hard to believe, but The Pottery Place Warehouse just got even bigger. For almost two decades, we’ve been offering both indoor decor and outdoor decor to Phoenix homeowners, so that they can express themselves with one-of-a-kind handmade creations. We don’t offer the same boring, cookie-cutter merchandise you see in all of the major department stores. Instead, we carry a massive selection of original items, in stock, with reasonable prices, and immediately ready to become a part of your living space. We built our business by listening to our many satisfied customers, and what people demand in today’s marketplace more than anything is choice. You will not find a better selection of indoor and outdoor decor items, in a wide variety of colors and styles, than at The Potter Place Warehouse. Come out and see us at our new location on Grand Avenue. You can follow these directions from Google Maps, or call us at (623) 214-9080 if there’s something specific you’re looking for. Visiting us is more of a Phoenix, AZ event than a shopping trip, so plan on staying a while, and be amazed at our ever-growing selection. Decorating your home shouldn’t be chore – it should be a means by which you express your personality. Unfortunately, the generic offerings at most furniture and department stores offer little to ignite the imagination, and the prices are usually laughable. We addressed these issues when we first opened our doors in 1998, offering a selection of eclectic and unique decorative items that infused people’s homes with life and color. By purchasing our merchandise direct from the small businesses that create them, we eliminated the middle man. This allows us to sell better quality items at prices that are often hard to believe. Whether you have a contemporary home, or chose a Southwestern, Spanish Colonial, or Tuscan motif, we have many items that will fit right in with your indoor decor. You may be looking for one large piece of colorful pottery to fill a space in the corner of your living room. Or you may be redecorating your bathroom and looking for tiles that are a little out of the ordinary. Either way, we are certain you will find something you never imagined in our showroom. When it comes right down to it, there are just too many items to list. Our selection has to be seen to be believed, so pay us a visit and find out why we are the first stop many people make when redecorating or accenting their home.